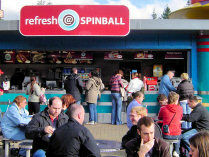 Merlin Entertainments, the resort's parent company, has announced plans to improve the offering of healthy foods at its theme parks. Alton Towers and other leading UK tourist attractions had previously come under fire from campaigning groups such as the Soil Association for their largely unhealthy menus. Since then, the park have made several major changes to their food and beverage selection, including the addition last year of Rita's Chicken & Ribs restaurant. McDonald's have also since been replaced at the park by Burger King, though whether this is a step forward or back in terms of health food, is debatable. Merlin want to take things further, however. To this end they have sought help from children's food and nutrition expert, Annabel Karmel MBE, author of fourteen best-selling books on nutrition. Her range of healthy foods will be available at Merlin's parks in time for Easter, and include meals such as fish pie, mild thai curry and pasta dishes. Also new for 2008 in the park's restaurants will be a new range of fruit and vegetable snack pots, such as carrot sticks and houmous. There will also be new lunch box options, containing healthier sandwiches, fruit and snacks. Finally, the restaurants' menus are being redesigned to encourage visitors - particularly kids - to choose the healthiest options. Visitors will be able to quickly and easily identify these meals by looking for the new 'Healthy Choices' logo, which will appear both inside and outside the restaurants. Gary Henderson, Head of Group Commercial Development at Merlin, said: "Improving the nation's diet is a huge and highly political issue, and not one which an attraction company can ever look to solve. "That said, we can do our part, regularly reviewing our menu choices in line with changing tastes; and making sure that our traditional and most popular dishes are cooked well, using fresh ingredients wherever possible. That must always be our priority. "Ultimately however, we can never forget that our primary responsibility is to provide a fun and enjoyable day out, and as such to allow our guests to take nutritional responsibility for their own food choices while they are with us."